Glenn Close is a phenomenal performer. Her work as an actress has spanned decades and have produced some of the most ground-breaking roles of all time. Perhaps best known as the infamous bunny boiler in romantic thriller Fatal Attraction, Close has immersed herself in such great films such as Dangerous Liaisons, 101 Dalmatians, Paradise Road, and has even played a mournful pirate in Hook. With all these under her belt, and many Academy Award nominations (but no wins…why Hollywood? ), you could say she is one of our best actresses. That being said, Close is truly at the top of her game in the brilliant drama The Wife. Glenn Close is phenomenal in Runge’s heavy-handed but emotive movie about a wife on the edge of her own becoming. She delves deep into the intricacies of this character whilst deftly handling her outwards persona. Close is soft in her approach to Joan, giving her patience and duty, whilst still stoking the fires of rage and passion beneath. With just a rise of her eyebrow or a well-placed pursed lip, Close conveys so many words, thoughts, and feelings. It is not just a great performance, it is an impeccable one and one of the few places where the movie anchors itself with some depth. Bjorn Runge’s background in theatre directing shows. Though he adeptly handles the piece here, the scenes can feel stifled with clear direction and lazy set-ups. The transition from paper to page loses fluidity and mars the film’s intensity which only bursts out into full boom by the penultimate sequences. Whilst Runge proves a good cinematic director, he isn’t a great one here. 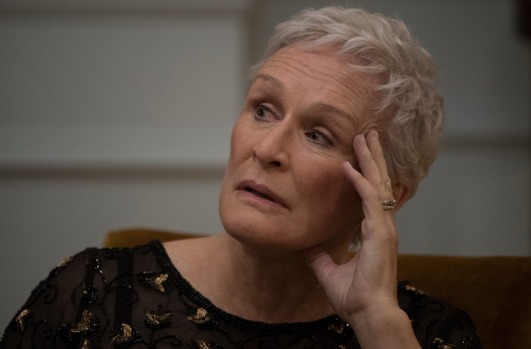 With support from Jonathon Pryce, Max Irons, and Christian Slater, The Wife is merely an perfect pedestal to parade Glenn Close’s formidable performance to the world. And we can hardly grumble too much about that. The Wife is out on DVD & Blu-Ray now!